A British company plans to build a huge coal mine, stating in its plans that it says will displace more than 40,000 people. It will destroy over 14,000 acres of land in Bangladesh’s most fertile agricultural region Phulbari in the north west, where most people have land-based livelihoods. Unsurprisingly, local people oppose the plans to destroy the landscape and homes. For over a decade now they have tried in their thousands to prevent the coming of the mine. Three have died when the Bangladeshi paramilitary were sent into confront protesters, and many more have been injured. To date, these protests, supported by international condemnation from UN human rights experts and NGOs such as International Accountability Project (IAP) and Global Justice Now (GJN), have prevented the mine being built. But London-listed mining company GCM Resources continues to push for their mine. And so, in 2012, concerned at renewed efforts by GCM to progress the project, IAP and GJN decided to make use of one of the very few mechanisms available to hold corporations to account for their activities overseas by filing a complaint against the company to the National Contact Point (NCP) under the OECD guidelines for multinational enterprises. Failing to hold their businessman to account, Rolf Nieuwenkamp, the chair of the OECD working party on responsible business conduct, has done a response piece to Christine Haigh‘s above article about the failure of the OECD process. Phulbari Activists have responded to Rolf Nieuwenkamp’s article in their comments as embedded below . When are going to make western companies liable for labour abuses of their suppliers? And directors of western companies personally responsible that certain standards are maintained by their supplier chain? If directors face prison for a negligent factory fire killing hundreds that should encourage a better commitment to supplier standards. That’s a hilarious joke given that the parties to the TPP and TTIP are about to grant corporations sovereignty, placing their activities above the law. Not to mention the massive frauds and illegal activities carried out by the largest banks. So there are progress in the developing countries; great…. cause for celebration even if big business hardly act exemplary just yet. But in Europe and the US big business increasingly do as they please. There’s no accountability as the political level has been bought through lobbying and financing of career politicians. Only the concern (I wouldn’t even call it fear) that whistle-blowers can trigger the occasional headline acts as a mild deterrent. It’s not like big business has suddenly acquired a moral compass……. the massive, institutionalized tax evasion we know they are all engaged in is evidence to the contrary. Okay, Mr Professor Rolf Nieuwenkamp, as you make me laugh out so loud by reading your hilarious rumbling to Christine Haigh’s polite opinion piece, I think that it is necessary to make a few comments in my own language to your rumbling – what I found not only a poor response but utter lies about the ill process of your NCP. I am sure you are aware that you rumbling failed to respond to the ever constructive article by Christine Haigh, who kindly wrote about us- the people from Phulbari. I wish to add my few comments for other readers who may not know what a hypocritical response it is, and who may not know how inhuman the UK NCP could appear to certain communities and groups of people in the far south who are seen as uncivilized to many Professors like you who serve organisations like the Global Coal Resources Plc. Note that I am one of those survivors who was nearly killed by your poisonous corporations, those ill-motivated and corrupted businessmen of Britain whom you and your hypocrite board have encouraged to go back to Phulbari to ruin my homeland. You and your colleagues have given a self contradictory assessment to the killer company who killed three people in Phulbari in front of my eyes. Instead of holding them to account, your NCP has decided to publish an ill-assessment, clearly suggesting that the company should go back to Phulbari to consult the local people so that they could destroy our people’s houses, pollute our water sources, and damage our greens and environment in the name of development and fossil fuel. 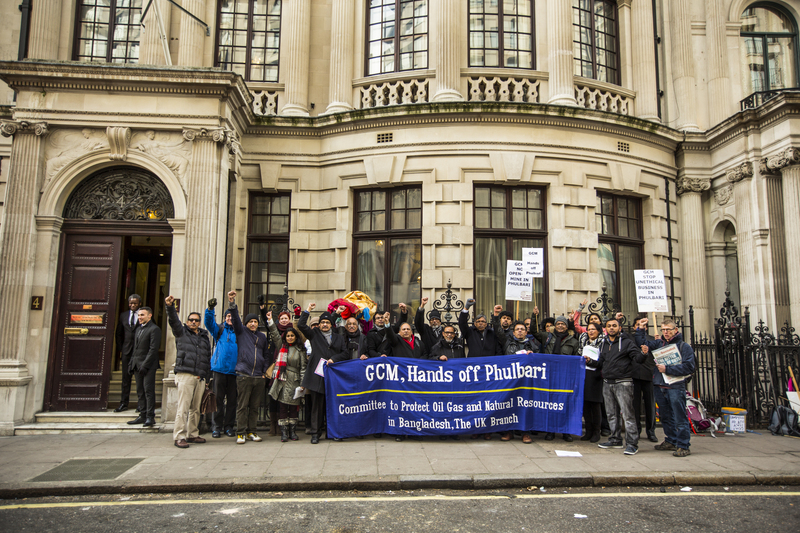 The report which you have published on 20 November 2014, overlapping the OECD process and denying the fact that GCM has already violated human rights in Phulbari, is not only a failure but denial to humanity. Your report has led to fresh violence in a town what was known as Bangladesh’s most peaceful locality. I am the woman who have witnessed both the killing of our people in Phulbari and the betrayal of the NCP to us throughout the OECD process. So please bear with me I have much to say about your failures and inhumanity. In your rumbling, you have failed to reference to the cases brought up in 10 February piece by Christine Haigh, and this indeed side-steps the particular concerns raised about them, in particular the Phulbari case. Several of your points are misleading, Mr Professor, what kind of Professor are you that couldn’t get the point after reading a whole 1000 words delivered by a climate activist? GCM has responded in writing to concerns from seven of the United Nations most senior human rights experts, who have called for an immediate halt to the company’s mine citing threats to the human rights of tens of thousands of people, and has advised the UN’s experts that “it would undertaken a Human Rights Impact Assessment (HRIA) before proceeding with the project.” The company, the Final Statement also notes, “has re-iterated this commitment to the NCP” (paragraph 67 of the NCP Final Report); But then the NCP suggests that GCM has not violated human rights in Phulbari! • Subject to any decision from the Government of Bangladesh on the project’s future, the UK NCP recommends that GCM continues to update its plans in line with current international best practice standards, and in particular to pursue and publish the Human Rights Impact Assessment it has advised the NCP it will include in this (paragraph 80). Yet, the NCP ends up giving a free license for overseas business to the corrupted businessmen who are unable to produce a valid contract with Bangladesh government. The findings and recommendations of the UK NCP’s Steering Committee, created to carry out the internal review of the NCP’s handling of the complaint which notes that GCM’s project “has aroused considerable opposition in Bangladesh, leading to violent protests, and an even more violent response by the authorities there.” But the internal review has left unpublished, just as the JCHR has left my report about GCM to the Parliament unpublished in 2009. I was told that my report was unpublished to save printing cost (as if the UK Parliament had been facing undescribable financial hardship) at that time, but what was your problem Prof. Rolf to publish your Internal Review online? The NCP’s Final Assessment stated that GCM has failed to ‘foster mutual trust and communications with locals’ and that they must re-evaluate the impacts of this project before going ahead for implementation. But then it asks the company to carry on with their business in Bangladesh, it approves the company’s attempts to re-enter Phulbari for further public consultation so that Phulbari people cannot sleep in peace. Please stay with me, I haven’t finished yet. “The NCP finds that GCM partly breached its obligations under Chapter II, Paragraph 7, which provides that enterprises should develop self-regulatory practices and management systems that foster confidence and trust in the societies they operate in. The finding is repeated in paragraph 50 of the NCP’s Final Statement: “The NCP therefore considers that GCM’s communications did not apply practices or systems that foster confidence and mutual trust with the [local] society in which it [seeks to] operate”, and in this limited respect the company breached Chapter II, Paragraph 7 of the Guidelines for a period beginning after August 2006 and continuing until 2012 when the Bangladeshi government authorized the resumption of activities locally and increased re-engagement began. As the NCP repeats this conclusion a 3rd time in paragraph 77, it is exceedingly difficult to understand on what ground did the NCP stated that “The NCP finds that GCM did not breach its obligations” under Chapter II, Paragraph 2, and did not breach its obligations under Chapter IV. Could you see Mr Professor that your Paragraphs 1 and Paragraph 5 are those ambiguous findings which created a ground for a judicial review of the OECD? That these mislead many of us including the company themselves, so that the company’s Chief Executive rushed to Phulbari and provoked for fresh violence in our Phulbari? Mind you, I am not an expert in OECD matter though even I could see the idiotic ambiguity in NCP’s final assessment of Phulbari case. Please beer with me I have much more to say about your failures and the harms your NCP has done to us in Phulbari. The fact that the 2011 OECD guidelines do “clearly” apply to “prospective” or potential human rights abuses was affirmed in an internal review of the NCP’s handling of the complaint. This is documented in paragraph 6 of the Recommendations of the NCP Steering Board Review Committee formed to carry out this internal review. In paragraphs 20 & 28, the Committee instructed the NCP to re-evaluate the complaint in light of its concern that the NCP made an error (paragraph 15) in not applying the 2011 Guidelines – which clearly include potential impacts – and revise it’s Final Statement in the complaint accordingly. However, the NCP proceeded to publish the Final Statement with no change other than a footnote stating the review had taken place. I have quoted in our press release to your worthless review of our case that the framework within which the UK NCP has assessed our case is extremely narrow, and the issues which were overlooked by the NCP was ill-motivated. We were found badly played out by your colleague and an ever bias woman, Liz Napier. After what you guys (at UK NCP) have done to us by publishing one of world’s most unethical and bias report of our complaint, I had no wish to even write a column about your rubbish failure. We have rather chosen to take to streets to protest and asked our government to close business with your unethical businessmen. I write now as you have made yourself such a deaf by your vague response to the failures that our friend Christine Haigh has noted in her article. You know that you have talked about success by sidestepping, and you didn’t have the courage to challenge any of the cases that we have watched being failed and let down by the UK NCP. The NCP wrote us to notify it “believed” it could to this quickly, denied our requests for the usual period granted for comment on the Final Statement, and also refused our requests for a delay in publication to allow its Steering Board to consider our concerns. Literally the only change made in response to the recommendations of the Steering Committee Review was to add a one-paragraph footnote to its existing Final Statement stating that it has carried out a re-examination. Other that this footnote, it did not alter a word of the Final Statement now published to its website (and attached here). It then proceeded to publish virtually unchanged. 1. The Committee erred in its findings that our Complaint deals only with “prospective” human rights abuses that have not yet occurred (see paras 5 & 6). For one important example, see comments below regarding ongoing violations of the rights of indigenous people. 2. Para 25 seems to give the NCP far too much leeway in deciding what it can exclude from its investigation of a complaint. Stay with me please I am showing you how failed you and your board are! Ongoing violation of the rights to self-determination and to free prior and informed consent (affirmed in the United Nations Declaration of the Rights of Indignenous Peeople) extending back to 2006. Both the NCP and the Steering Board Committee have erred in saying that all concerns raised in our complaint are about “prospective” or “potential” rights. This is factually untrue as indigenous people have been fighting this project for over eight years. The NCP has incontrovertible evidence of this, including: its written notes from an interview with an indigenous leader who told her that indigenous people were willing to go to war to halt the project; Rabindranath Soren’s letter to the UN Forum on Indigenous Issues (attached); and the 2008 community letter to the ADB signed by several indigenous leaders. The former UN Special Rapportuer on the Rights of Indigenous Peoples, James Aanaya, has twice conveyed his concerns about this in his official communications in the record of the UN (one is attached), and you will find detail on this in our letter of 3/12/14 as well. 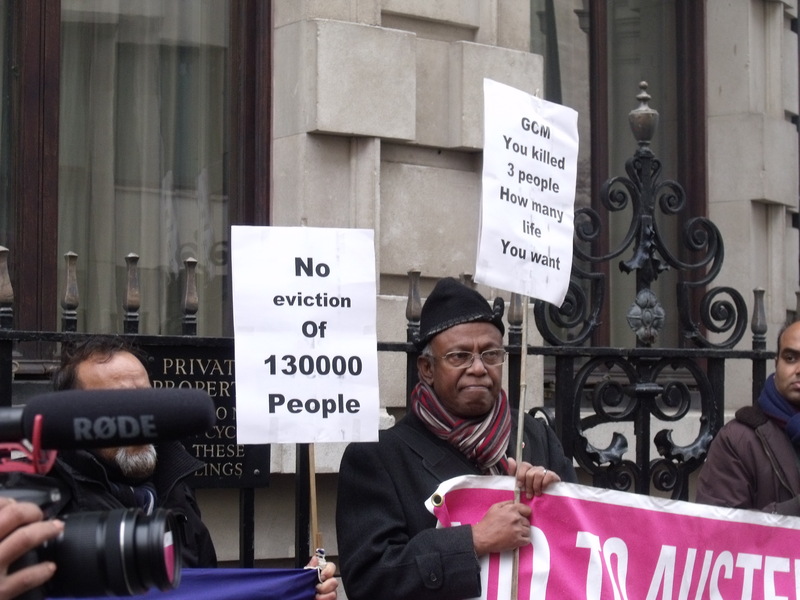 Forced eviction of tens of thousands of people (over 40,000 by GCM’s count, far more by others). Important: these are “forced evictions” as defined in international law and in the UN Basic Principles and Guidelines on Development-based Evictions and Displacement authored by Miloon Kothari in his former capacity as the UN Special Rapporteur on the Right to Adequate Housing. International law recognizes that forced evictions are a gross violation of human rights in themselves. You can find content on this on in the attached letter from Miloon Kothari. The NCP said it was limited the scope of its investigation to exclude any consideration of potential impacts and would only consider inevitable or unavoidable impacts. This is an outrage in itself, because the language of the 2011 OED Guidelines is very clear that they apply to “potential” impacts and impacts that “may” happen. Even if we agree to this limit to the NCP’s assessment – which we most definitely do not – these forced evictions are unavoidable or inevitable if the project goes forward. Even GCM does not take the position that these the eviction of tens of thousands of people in order to implement its project. The restrictions on civil and political rights of people opposing the project and high potential for further violence if GCM persists in its efforts to force the project forward despite massive opposition in communities threatened by its project, including the state-backed use of lethal force already seen in 2006. As you are aware Professor, the Final report of an Expert Committee formed in 2006 and tasked with assessing the proposed project warned of the high risk of social conflict and unrest if as many as a million people (their estimate) are displaced and numerous international organizations, including IAP and the World Organization against Torture have repeatedly expressed grave concerns about the high potential for further violence and loss of life. The NCP is also aware the RAB, denounced as a “death squad” by Human Rights Watch, has repeatedly been deployed to demonstrations against the mine and is also aware of the bloodshed and loss of life in 2006. The NCP dismissed the findings of the attached submission of the Essex Business and Human Rights Project as being “commissioned” by the complainants. The study finds that GCM failed to meet its due diligence requirements to avoid further human rights violations associated with this project. There are so much more to expose your ill-process and ill-motivated assessment to our Phulbari case Professor that I couldn’t finish in commenting here. I think that I will better go for a proper response by one another powerful article in a social media who may not reduce our response to comments only. I want to elaborate how badly I felt being played out by your colleague Liz Napier. I was meant to be an eye witness, and I have given two hours long account/interview to Liz Napier at a moment when my dearest mother was at the Intensive Care Unit, when she was dying at home. But neither she nor any of you did cite one line from my eye witness. You simply didn’t recognise the significance of our accounts. Indeed, you failed to cite any of the first hand accounts from Phulbari where people said that they would die but would not give their land. You did not think that these comments demonstrate the severity of the concerns and the risks (possibility for further human rights violation). The NCP’s carelessness, irresponsibility and unethical attitude were obvious in a comment by your colleague Liz Napier. In October 2013, when I have emailed her informing that I was receiving malicious calls and harassment on telephone at mid night which were similar to 2010 (when my house was burnt down), and I requested that the NCP UK shouldn’t share my contact details with any third party, Liz Napier replied -in one line-that ‘we have no reason to share your contact details with anybody’! I saved that email of Napier. This response was not only callous but also intentional because Napier failed to assure the interviewee that the NCP would never share her contact details to anybody by any means. I wondered and wondered why was this so difficult for a communication officer at NCP to say something reassuring to the interviewee, rather than reactionary? Why is it that the affected communities and individuals representing communities have to flatter you guys for our moral rights? And my friend Dr Samina Luthfa, and a community researcher who completed her PhD and explored narratives of the tremendous resistance to open pit mine in Bangladesh, dedicated her valuable time to interpret the interviews from Phulbari. She was dumbfounded by the way your colleague Liz Napier and your NCP board have misinterpreted some of the affected individuals’ accounts. Samina wrote to Liz Napier in June 2014 that the UK NCP has no right to change the original version of the accounts that she has interpreted from Bangla to English. Napier told that she was going to find out the original accounts and would have looked at those accounts which we found as corrupted by the UK NCP board. As usual, shamefully, this has never happened and Napier has never returned to any of us with our original accounts. I felt really sick, Professor! I am sick of talking about the way our Phulbari case has been handled by the UK NCP. You couldn’t please me by your article about success. It made me rather frustrated and angry so as to expose your corrupted process of OECD. The only one point which makes a little sense to me is that of your bit of realisation, that you realised that your system needs improvement. It is also good to know that you are aware of the fact that there are powerful criticisms: “Yes, there have been serious criticisms”. But then you spoil your own realisation by the next comment: “but many NCPs are working to improve their structure and also find new ways to deal with challenging cases through both mediation and proactive prevention.” Please can you give us some appropriate examples of those processes and new ways to deal with our challenging cases? A friend of mine have asked : Is it a truly satisfactory measurement of the NCP system to be either ‘half-full’ or ‘half-empty’? Regardless of one’s perspective is it a 50 / 50 proposition? Please answer. In the meantime, I can write my own article which will expose that your whole system needs serious treatment. This entry was posted in Bangladesh, Global Justice Now, International Accountability Project, National Committee of Bangladesh, National Contact Point UK, Phulbari and tagged Asia Energy, Bangladesh, dirty coal, Forced Displacement, GCM, Global Justice UK, Land grabbing and Human rights abuses by British coprporations, The Guardian Global Development Professional Network, UK National Contact Point. Bookmark the permalink.